On Sunday July 19 from 1:00 pm to 4:00 pm, more than 40 agents representing 18 real estate brokerages located throughout Westchester and Putnam counties will host a “Day of the Open Door” community open house event for antique houses. 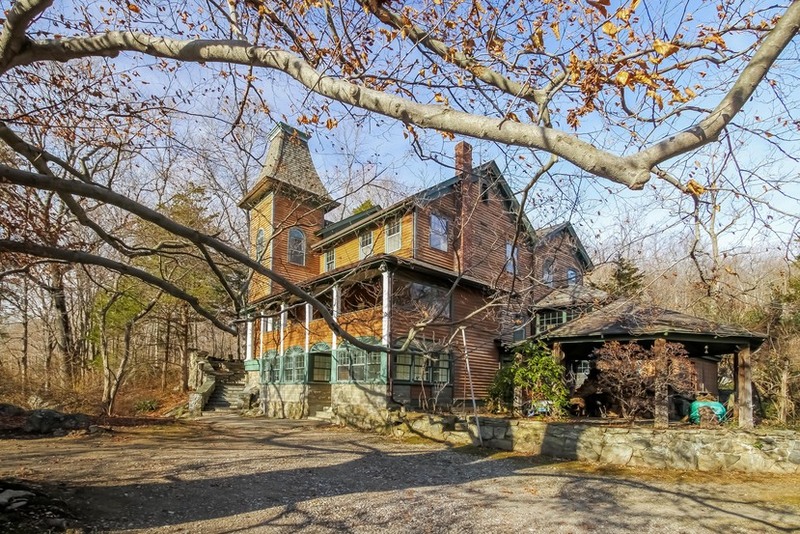 The houses which were built between 1750 and 1929 are all currently on the market. Prices range from $175,000 to $1,939,000. William Raveis Real Estate, 914-522-2076. “With the advent of the internet, we know that, in general, buyers are not always local. We also know that the majority of buyers, even those who are local, use the internet to conduct their searches 24/7. When they find a house they like, they drive-by; and, if the curb appeal meets their expectations, they attend an open house to view the interior, usually without an agent. “This process works well if the buyer is planning to buy a contemporary, suburban house. 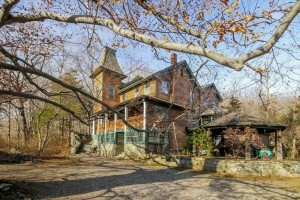 However, because there are few antique houses in any given location, finding the right house can be a tedious process, even using the best internet search techniques. “The real estate business has changed dramatically; and, in response, we agents have to change the way we do business. The antique house market gives us the opportunity to study a small market segment and develop a workable approach to it. We have to engage the buyer much earlier in the purchase decision process. “Similar to the internet, we have to find a convenient way to present an array of houses at a single point in time so that buyers can compare and contrast interesting properties – in real time. More importantly, we need to respect the buyers’ independence. Bill James almost wishes he had been in charge of transportation at MetLife Stadium when thousands of Super Bowl fans were stuck for hours last February, waiting for trains to take them back to Secaucus Junction. The Minneapolis inventor figures he could have emptied the big East Rutherford stadium at least three times faster by using his patented solar-powered JPod monorail system, sometimes called personal rapid transit. “Trains are inefficient, especially in stadiums,” he said in an interview last week, noting that big venues usually provide only two portals per train — one in, one out — which can make boarding large groups on big passenger cars exceptionally time consuming. These waits can be especially annoying for return trips and re-boarding, particularly when trains make local stops. As James tells it, his privately financed system of small, high-speed cars — or pods — cruising high above traditional traffic, could revolutionize mass transportation. This argument is especially compelling in densely populated places like North Jersey, where thoroughfares become clogged at the slightest provocation near a mall, an industrial park, an airport, a university, a hotel or a big stadium on Route 3. If these locations could be adapted to include dozens of portals for easy entry and exit, he said, a solar-powered network carrying hundreds of pods could quickly and inexpensively transport hundreds of small groups of four or five passengers from major thoroughfares to specific destinations and back again. Bill James holding a model of the solar system that will power his monorail. If that sounds far-fetched or cost-prohibitive or just plain crazy, keep your eyes on the Secaucus side of Route 3 at Meadowland Parkway opposite the stadium and the big American Dream Meadowlands complex now under construction. Three miles of busy Meadowland Parkway is where James plans to begin building his own dream — a $120 million, solar-powered monorail system — that’s expected to get under way by early next year at the latest. His point is that correctly designed personal-rapid-transit systems might well be, according to James, the fastest, safest, most energy-efficient, most convenient, most cost-effective, most environmentally sound way for people to get around in the 21st century. This claim is open to strenuous debate, of course, among experts who have researched mass-transit alternatives for decades. For example, Princeton University Professor Alain Kornhauser, once a strong advocate of personal rapid transit, has shifted his research emphasis to Internet-based driverless cars — formally called autonomous vehicles — that require little, if any, alteration of existing roadways. James believes his Secaucus pilot project will become the first part of a network that will continue another three miles east on Routes 3 and 495 to the Lincoln Tunnel at Weehawken, assuming he can get the necessary state approvals. But as with nearly every start-up, nothing is certain. Low-cost solar power that drives the system. Lightweight pods that help cut operating costs to a tenth of the cost of cars and an eighth of the cost of trains. Driverless computerized routing with an onboard keypad that allows passengers to determine each stop along the network. Private ownership and investment of the system that eliminates the need for government financing. Inexpensive fares in the $5 range, including a 5 percent fee for the municipality. Although Secaucus hasn’t awarded JPods Inc. a building permit yet, approvals seem all but assured. Last June, the mayor and council adopted energy-efficiency standards for building personal-rapid-transit systems over its rights of way that fall well within JPod’s parameters. James, a West Point-trained engineer who once built computer systems to manage just-in-time manufacturing products, had been scouring the nation for 16 years to find a government entity willing to accept his ideas. When asked about jurisdictions that ignored or rejected his proposals, he began reciting a long, long list. “San Jose; Atlanta; Minneapolis; St. Paul; Rochester, N.Y.; Rochester Minn.; Seattle; the Port Authority of New York and New Jersey; the New Jersey Department of Transportation. There are at least a couple of hundred,” he said. Part of James’ problem is his lack of a prototype — a small working model that shows his concept is valid. Without it, he found it difficult, for example, to sell the Port Authority on a system for Newark Liberty and La Guardia airports. The state Department of Transportation also refused to give right-of-way authorization for a system that crosses state highways. Early in his quest, James realized his ideas would never attract public financing. He said he has found backers to raise the $120 million needed to build the project. Yorktown Heights, NY – Oct 12, 2014 – “The Wright Brothers traveled 120 feet and changed the world; JPODS will travel 100 meters and revolutionize transportation from this point forward,” says Bill James of his pioneer transportation system, JPODS. 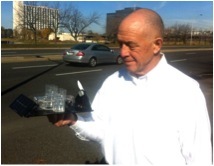 James, who has spent 16 years developing JPODS, will be welcomed today by Yorktown Supervisor Michael Grace and Chamber of Commerce President Joseph Visconti in order to provide a “tease” of his solar-powered transportation system, to be introduced officially and demonstrated November 10, 2014 in Secaucus, New Jersey. According to James, JPODS is a fully solar-powered monorail system that is designed to eliminate congestion in urban areas with “10x” efficiency, utilizing 85 percent less energy than most personal transportation vehicles with absolutely no carbon emissions. Factors like the light-weight vehicle design, lack of startup and shutdown procedures and absence of fossil fuels also make JPODS cost-effective to build and maintain. “Combatting ‘civilization killers’ like global climate change, highway fatalities and resource wars,” James says, “the JPODS system will not only appeal to the public for its cost benefits, but for its ideological factors as well. The press conference in Yorktown Heights today acts as a preview for the main event on November 10, 2014, in Secaucus, NJ, the first city in the world to approve the installation of JPODS. There, a rescue installation will be built and demonstrated for the world press to show its efficacy, then disassembled for reassembly in other communities throughout the nation for demonstration purposes. For further information about the JPODS system, visit http://www.jpods.com/, or call Primavera Public Relations at 914-245-5390. To speak to Bill Primavera directly, call his cell at 914-522-2076. 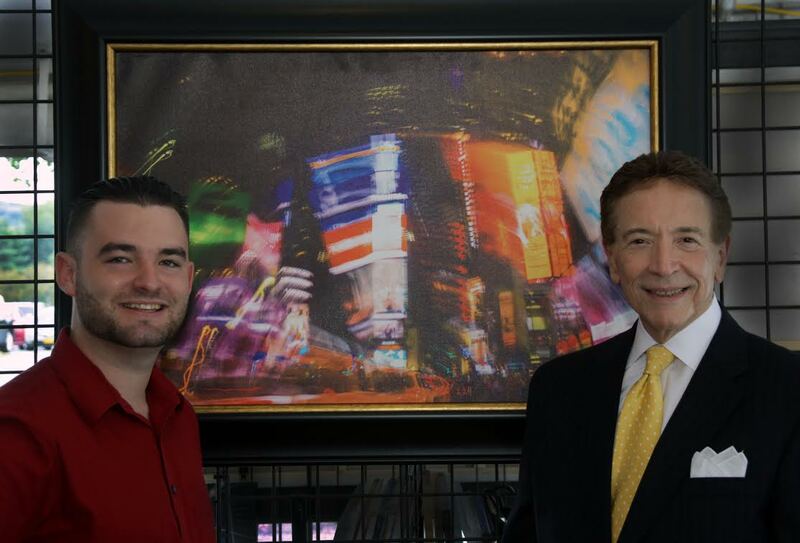 “Paintographer” Craig Alexander, left and Bill Primavera, The Home Guru, announce Landmark Paintography, the first venture of The Home Guru’s new online home decor business, to be introduced in October. Until then, the art can be purchased at The Big White Art & Rug Tent at the Jefferson Valley Mall. The Home Guru, aka Bill Primavera, is introducing a new business: an online home decor store whose first product will be “Landmark Paintography,” art on canvas where you can’t tell whether it’s a painting or a photograph because of its artistry and lighting (hence the combined word), personally signed by “paintographer” Craig Alexander, a world-traveled young man (not yet 22) whose penchant is for landmarks in major cities. Alexander is poised to be branded by Primavera’s PR firm, Primavera Public Relations, Inc., Westchester’s longest running marketing firm. Primavera says that the official introduction of the online store business will be made at a press conference at the Yorktown Fall Festival & Street Fair on October 12, but in the meantime, there will be preview sales of Craig Alexander’s New York Paintography Collection at the Rug & Art Tent at the Jefferson Valley Mall at 650 Lee Boulevard in Jefferson Valley, NY. For more information about the canvasses, call Craig Alexander at 727-871-6671. 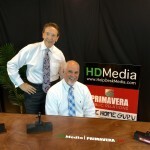 For more information about The Home Guru, its products and services, visit:www.TheHomeGuru.com or call Bill Primavera at 914-522-2076. Yorktown Heights, NY, June 6, 2014 – William Raveis Real Estate, the largest family-owned real estate company in the Northeast, announced that it has appointed Primavera Public Relations, Inc. (PPR) as its agency of record to represent its Hudson Valley operations. At the same time, it was announced that Primavera PR will be launching a major year-long project designed to engage the New York William Raveis offices further into its communities. That program involves the sponsorship of a program organized by Physicians Against World Hunger which benefits organizations dedicated to alleviating hunger and homelessness in Westchester County as well as in developing counties. Primavera’s firm will be guiding Raveis’ efforts in each area where the company’s offices are located, to organize and produce a major event in which the region’s best restaurants and wine suppliers will participate along with merchants who will contribute to a fine quality silent auction. The local Raveis realtors will act as ambassadors for the program from each of the Raveis offices, 13 of them currently – Armonk, Briarcliff Manor, Chappaqua, Rye, Harrison Hastings-on-Hudson, Irvington, Katonah, Nyack, Piermont, Tarrytown, Warwick, and Yorktown Heights – and several more to come on line before the event on November 23, the Sunday before Thanksgiving. William Raveis Real Estate, Mortgage & Insurance is the No. 1 family-owned real estate company in the Northeast and the No. 8 real estate company in the country, according to REAL Trends. For five consecutive years, William Raveis’ Real Estate, Mortgage and Insurance divisions have been awarded the Gold Medal distinction by the Commercial Record and have been similarly recognized by Banker & Tradesman. The firm was named the Most Innovative Brokerage by Inman News, and has consistently been ranked the best place to work by Fox CT, Hearst Connecticut and the Boston Business Journal. William Raveis has 3,000 highly trained sales professionals in 100 company-owned and affiliate offices in Connecticut, Massachusetts, New York, Rhode Island, New Hampshire, New Jersey and Maine. For more information, visit the best website in real estate, raveis.com, or blog.raveis.com.